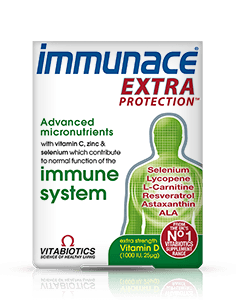 Immunace Extra Protection provides an advanced research based formula of 28 nutrients, including all the benefits of the original Immunace, plus additional nutrients, such as natural lycopene, resveratrol, astaxanthin, alpha lipoic acid and extra vitamin D at 1000 IU. Developed by Vitabiotics' experts, Immunace Extra Protection gives you extra nutritional support with higher daily levels of vitamin D to contribute to the normal function of the immune system. 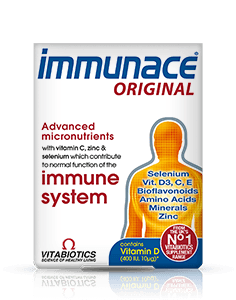 Immunace provides a comprehensive formula including additional Vitamin D, Zinc & Selenium which contribute to the normal function of the immune system, plus folate which contributes to normal blood formation. Immunace was one of the UK's first immune system supplements to pioneer and recognise that Vitamin D not only contributes to the maintenance of normal bones and muscle function, but also contributes to the normal function of the immune system. New research shows that optimum intake levels of vitamin D may be higher than previously thought. Each tablet of Immunace Extra Protection contains an optimum level of 25mcg (1,000 IU) of vitamin D3, which is the specific form made naturally by the human body and therefore preferred over D2 which is found in some supplements. Lycopene is the bright red carotenoid pigment found in tomatoes. Lycopene is an intermediate in the biosynthesis of many carotenoids, including beta-carotene. Lycopene is not synthesised in the body and must be obtained from the diet. Resveratrol is found in the skin of red grapes. Resveratrol may contribute to cardiovascular health and has been identified as one of the protective substances found in red wine. Immunace Extra Protection provides a comprehensive range of vitamins and minerals.The Immunace formula was originally developed in conjunction with an international expert in nutrient research, based on scientific evidence of the role of specific nutrients in the normal function of the immune system. Immunace Extra Protection is available in the UK from Boots, independent pharmacies, leading supermarkets and health stores. Alternatively you can order online here. Always read the product directions before use. Do not exceed the recommended intake. As with other food supplements seek professional advice before using if you are pregnant, breastfeeding or suffer from food allergies, and consult your doctor or pharmacist if you have an underlying medical condition, or if on medication. This product contains iron, which if taken in excess may be harmful to very young children. Vitamin supplements are not intended to treat or prevent any disease. Food supplements must not replace a balanced and varied diet, and a healthy lifestyle. As Immunace Extra Protection contains vitamin K, if you are taking oral anticoagulants (blood thinning medication) do not take these tablets except on the advice of a doctor.